Reunions and betrayals! Our reckless heroes stage a rescue mission to save Rex-and secure the nuke still threatening to kill everyone. Along the way, Billy and Molly make a pit stop at a galactic gas station, where they discover brain-freezes and morality, and past demons catch up to Dust and Fury. 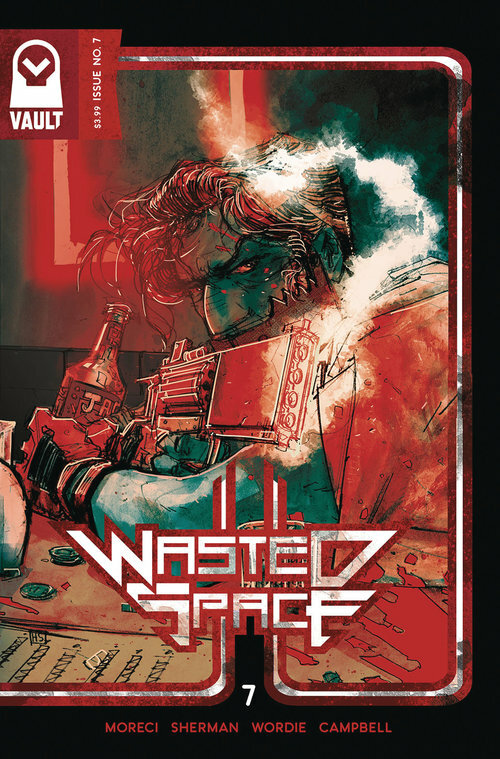 I've tried to define Vault Comics' brilliant sci-fi adventure series 'Wasted Space' and with each issue, it becomes more entertaining but not as easily described. Sure, there are themes and actions that recall Star Wars and Star Trek but Michael Moreci's dialogue has a rhythm and depth that echoes more Aaron Sorkin than Orson Scott Card. The artwork by Hayden Sherman and Jason Wordie is so visually striking and unique that it captures the imagination and adds immeasurable depth to the characters and the environment. The art and script go hand-in-hand, making it hard to imagine Moreci's words without Sherman/Wordie's art. 'Wasted Space' continues to be a delight.